Faq Whakatane beacon 4 12 2015 ElectricKiwi.co.nz - Smaller. Smarter. We're proud to now be able to offer our great value electricity in the place where it all began - Whakatane. This is something of a homecoming as the three founding partners in Electric Kiwi - Julian, Huia and Phill - all grew up together in this great little town. What's more, Powerswitch has ranked Electric Kiwi as the cheapest of all power companies in the area - an extra reason for us to cheer. 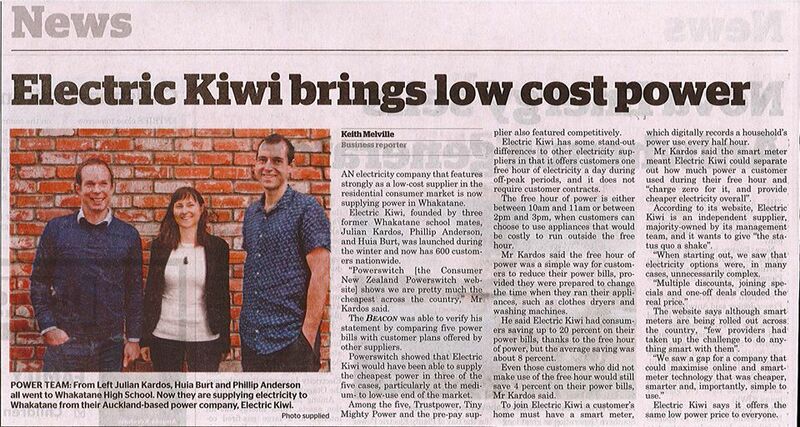 Our managing director Julian Kardos spoke to the Whakatane Beacon about bringing cheaper power to locals and why it's good news for the area - whether you plan to be a customer of ours or not!